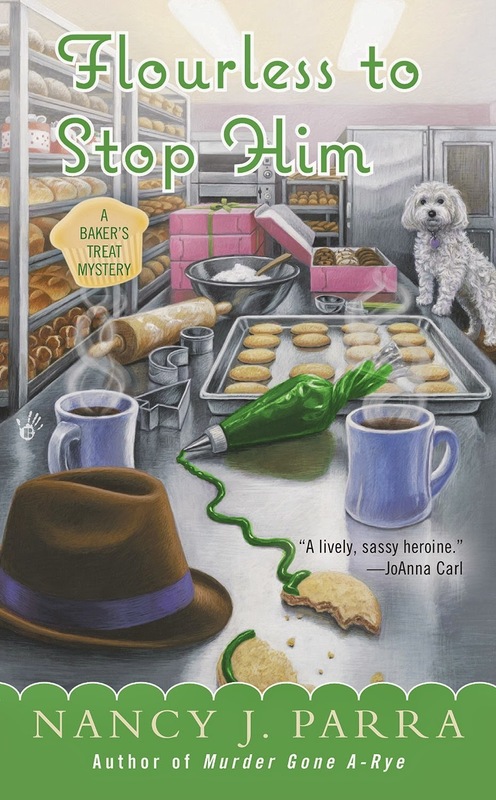 Hi, Toni Holmes here from the Baker's Treat Mystery series. January is a great time to start anew. The usual January motto is "New Year, New You." There are many people with resolutions to eat clean and to read more. What better way to do both than to enjoy a gluten-free bakery mystery series that includes lot's of yummy recipes? Of course, I may be biased. After all I run a gluten-free bakery. Not every gluten-free item is good for your diet, either. But for those with allergies, it's good to have a recipe or two for those special celebrations. Like birthdays...January is our author's birthday month and so I'm celebrating by sharing a flourless chocolate cake recipe. How ideal if you could eat flourless chocolate cake while reading "Flourless To Stop Him," which you can pre-order now. It comes out in early May. What is your favorite birthday treat? Preheat over to 375 degrees F. Butter an 8x8 inch pan. Melt butter and stir in cocoa (be sure to get rid of all lumps) and sugar. Add eggs and whisk well. Pour batter into pan and bake for 25 minutes until crust forms. Cool in pan 5 minutes and invert. Dust with powdered sugar and enjoy! It sounds very good! Does it need to be eaten right away, or is it good for a couple of days? That looks yummy--and quick! I'm planning to try it. Soon. And your title makes me laugh. Thanks, Willow!! I hope you like it. Happy Birthday to your author, Toni, hope she has a great one. I love a story about bakeries and can't wait to check this one out. Thanks for the recipe. Hi Lorraine, I hope you enjoy! I really enjoyed Murder Goes a-rye and am looking forward to this new book in the gluten free series.